If you’re new to tofu (which is made from soybeans), this is a great recipe to start with. 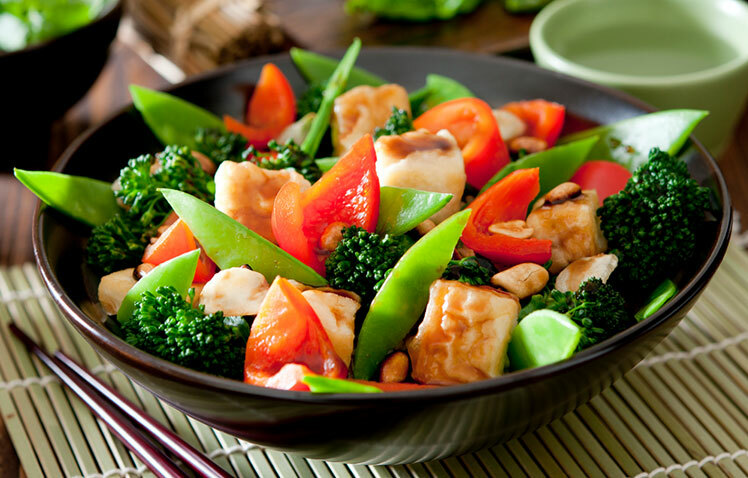 You could also use cubed chicken with this stir-fry! This is also a great dish to use vegetables that are in season in your area. Heat a wok or large skillet over medium-high heat. Add oil. Brown tofu on both sides, then remove from pan and set aside. Add onion to wok and sauté. for 1 minute. Add broccoli, carrots, peas and red pepper; stir-fry until tender-crisp, about 5 minutes. Return tofu to wok and stir in broth, chili sauce and orange zest. Heat until bubbling. Transfer stir-fry to serving platter and sprinkle with cilantro, if using.